Cocooned in a stunning small bay of the promontory of the Argentario, facing the limpid waters of the sea of Tuscany. In the surroundings of the hotel there are various attractions to be visited: medieval towns at 30 km, Maremma National Park at 40 km, the islands of Giglio and Giannutri at 30 minutes boat ride. The distances for the airports are approx. 150 km for Rome Fiumicino and approx. 200 km for Pisa. Very alike a private club embedded in the Mediterranean vegetation with old olive trees, cypress-trees, oleanders, bougainvillea, rosemary and lavender scents. Il Pellicano is part of the Leading Hotels of the World with six villas and the main building where there are some of the rooms, the hall, the restaurant and bar, a very nice terrace with stunning view over the sea, a seawater pool and the Pelliclub “Health & Beauty”. 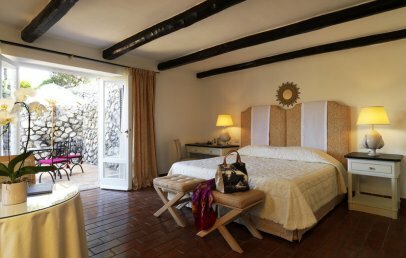 In this lovely frame of the Tuscan Maremma you will find the perfect romantic hideaway with peace, tranquility, privacy and traces of the mid-60s of Michael and Patricia Graham. A reason why many international stars have been attracted since 1965 from this elegant 5-star Hotel. Children are welcome from the age of 8 years. 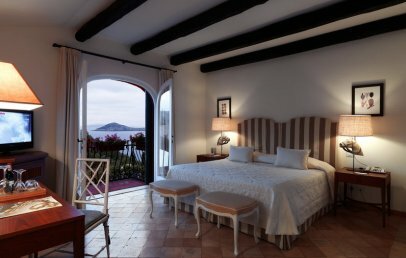 Il Pellicano has in total 50 accommodations with double rooms (divided in Standard and Garden View), 15 double rooms with Sea View, Junior Suites and Deluxe Suites (divided in Deluxe Suite Sea View, Master Deluxe Suite Sea View and one Deluxe Suite Sea View with private pool). The six cottages take their names from some aquatic birds: Beccaccino, Cormorano, Ducula, Egretta, Folaga, Gabbiano. The rooms are either located in the main villa or in one of those cottages and are decorated in homey, cottage-style, with exposed wooden beams, plain furnishings, terra-cotta floors and dispose of a patio or a terrace with sea or park view. All of them are differently furnished. The hotel, designed as a classy refuge in which regenerate, offers to its guests the opportunity to receive health treatments in the "Pelliclub Healt & Beauty" where you can regain your own harmony and physical wellness through the use of detoxifying treatments with Santa Maria Novella products (available also in the boutique shop). Depending on the time you want to spend in the SPA, you can choose a single treatment or seek a customized treatment program of one, two or six days. The offer is completed by a fitness center with Technogym equipment, the "Calidarium”, sauna baths inspired by the ancient Rome and the hairdresser. The elegant restaurant of "Il Pellicano" with one Michelin star offers excellent dishes of the Mediterranean tradition in a pleasant and stylish atmosphere. To be highlighted is the professionalism of the waiters, attentive and charming in dispensing sensible advice to guide the client also through the wine list. During the warmer months the restaurant "Pelligrill", with an open air terrace, is open for lunch and dinner and serves typical dishes of the gastronomic tradition of Tuscany. Wine is fundamental at "Il Pellicano", therefore the wine cellar "La Cantina" ranges from Tuscan big guns to vintage champagne, excellent white and less known wines from the Maremma region and surroundings. The sommelier is glad to share his knowledge and to help guests to find the perfect wine for their meals. More than 2000 labels are in the wine cellar, an ample selection, and some of them are available for purchase to carry or ship it back home. 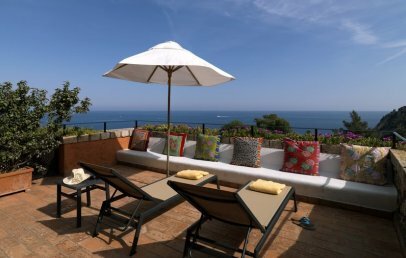 Il Pellicano offers different services as a private rocky sundeck on the sea – reachable through an elevator, carved in the stone – a heated sewater pool, high speed internet Wi-Fi connection, concierge service, garage and tennis court. 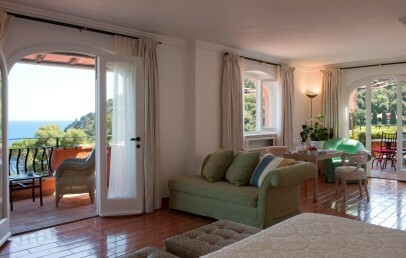 The prestigious 18-hole Golf Club Argentario is at only 10 km from the hotel. The city tax has to be paid on-site. 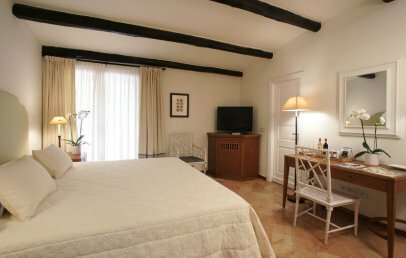 Comfortable double room located in the cottages in the garden of the hotel. The rooms are decorated with a nice combination of colors. All rooms have a private bathroom and garden view. It is possible to accommodate up to 3 adults (3rd bed is a sofa bed). Minibar included in the room rate. 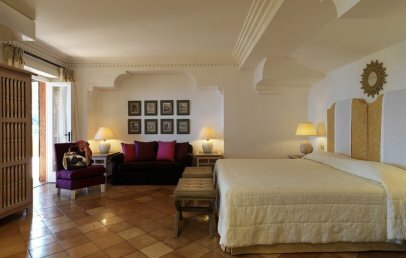 These double rooms are located in the main building of the hotel. They are comfortably furnished with soft colours and fabrics. 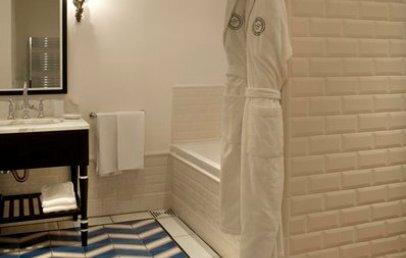 All rooms have a private bathroom in marble and a balcony. Minibar included in the room rate. These double rooms are located either in the main building or in the cottages of the hotel. They are comfortably furnished with soft colours and fabrics. 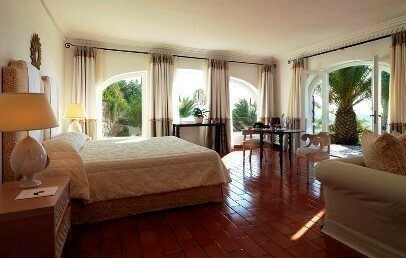 All rooms have a private bathroom and a balcony or terrace with panoramic sea view. It is possible to accommodate up to 3 adults (3rd bed is a sofa bed). Minibar included in the room rate. 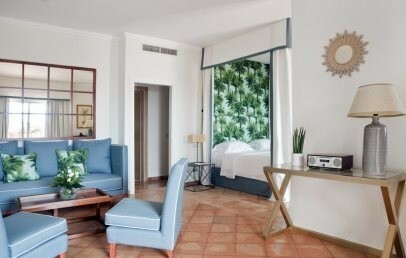 The Junior Suites are located either in the main building or in one of the cottages of the hotel. 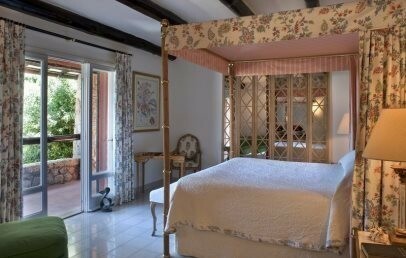 They are elegantly furnished in the traditional Tuscan style and have a night and a day zone with a divan. 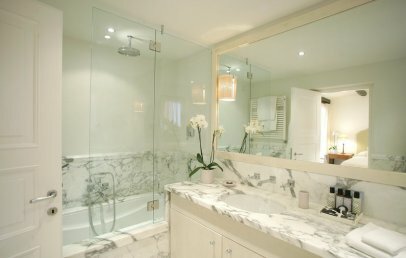 The bathroom is spacious and lined in marble or Italian ceramics. Every Junior Suite has a terrace with fantastic view on the sea. Minibar included in the room rate. 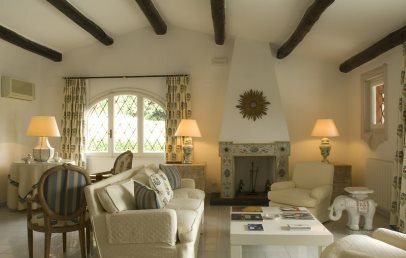 The Suites are located either in the main building or in the cottages of the hotel. 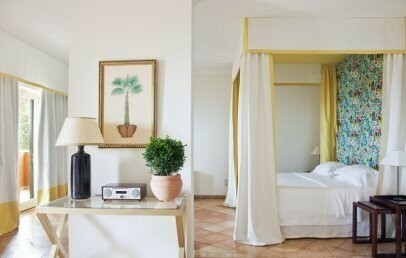 They are elegantly furnished in the traditional Tuscan style and have a night and a day zone with divans. Minibar included in the room rate. 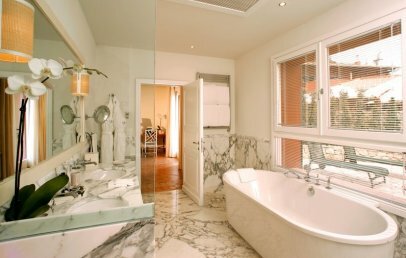 The bathroom is lined in marble or Italian ceramics. Every Suite has either a balcony or a terrace with fantastic view on the sea. Strategically located in the cottages or in the central building, they have a breathtaking view over the Tyrrhenian Sea from their spacious terraces and are immersed in the greenery of the property. 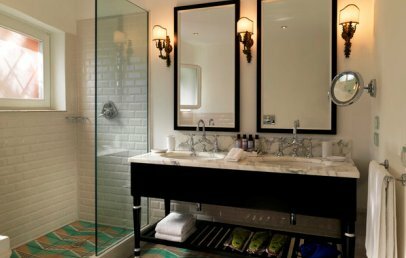 The Master Deluxe Suites are decorated with antiques, designer ornaments and modern fabrics, coming together to create a luxury vintage feel. Some two-bedroom Suites are available for families. Each Suite can accommodate up to 4 people.